The very senior senator from Utah will not after all run for an eighth term, and will instead open a path to the Senate for Trump nemesis Mitt Romney. After threatening to run for an eighth term this November, president pro tem of the Senate Orrin Hatch of Utah announced today he’d instead hang it up next January. The imminent departure of the 83-year-old Hatch opens the way for former Massachusetts governor and GOP presidential nominee Mitt Romney to run — or more likely cake-walk, given his popularity in Utah — for the seat. Hatch won his primary convincingly, but did promise his seventh term would be his last. That became a real problem for him when at various points in 2017 he began publicly considering yet another race. 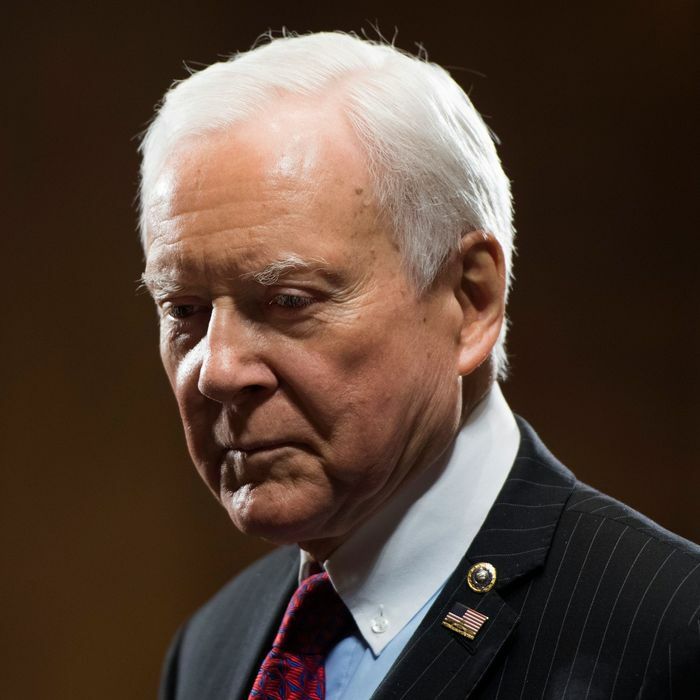 A Salt Lake Tribune poll last August showed 78 percent of Utahns wanting Hatch to retire. This sentiment seems to have been enhanced by reports that Mitt Romney would run for the seat if and only if Hatch stepped down. Hatch’s future became a national political football last year. Trump adviser and Breitbart News chief Steve Bannon initially listed Hatch as one of the targets of his right-wing purge of insufficiently Trumpian Republican senators. But when the Romney talk started, Bannon abruptly switched tactics and began begging Hatch to run yet again. A friend of Bannon — the president — tried to talk Hatch into sticking around during a late-year visit to Utah. But it was all to no avail. Hatch apparently viewed the enactment of the GOP tax bill — which came out of his Finance Committee — as something of a career capstone. And so Trump & Co. will probably have to come to grips with a Senator Romney in 2019, a man with the national stature to become a lightning rod for anti-Trump sentiment in the GOP just as the 45th president prepares for a reelection campaign.